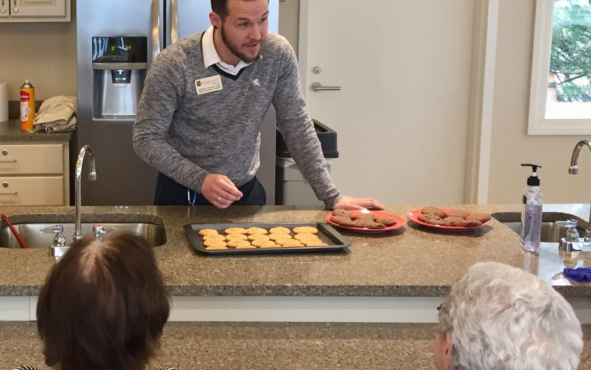 Since beginning working at Whitney Place Assisted Living and Memory Care at Sharon a year ago, Matthew Johnson, Tapestry recreation coordinator, has had an evolving role as he has taken on diverse tasks and become an essential part of the fabric of SALMON. Matthew began working at Whitney Place last October when the community first opened and he quickly began to grow with the campus. He began as a PCA, but managers at the community identified that his out-going personality and creative thinking skills would be better utilized in the recreation department. He worked as a recreation assistant, then his current role of Tapestry Program recreation coordinator. In this role, Matthew plans and leads daily activities, events and outings within the Tapestry neighborhood. He also pitches in to help with care, meal modeling, emotional support or any efforts that make life at Whitney Place more pleasant for residents. When he’s not engaging with residents, he’s engaging with their families to help support them with any needs or concerns they have.